AS to the difference between that material civilization now prevailing, and the divine civilization which will be one of the benefits to derive from the House of Justice*, it is this: material civilization, through the power of punitive and retaliatory laws, restraineth the people from criminal acts; and notwithstanding this, while laws to retaliate against and punish a man are continually proliferating, as ye can see, no laws exist to reward him. In all the cities of Europe and America, vast buildings have been erected to serve as jails for the criminals. Divine civilization, however, so traineth every member of society that no one, with the exception of a negligible few, will undertake to commit a crime. There is thus a great difference between the prevention of crime through measures that are violent and retaliatory, and so training the people, and enlightening them, and spiritualizing them, that without any fear of punishment or vengeance to come, they will shun all criminal acts. They will, indeed, look upon the very commission of a crime as a great disgrace and in itself the harshest of punishments. They will become enamored of human perfections, and will consecrate their lives to whatever will bring light to the world and will further those qualities which are acceptable at the Holy Threshold of God. O THOU beloved maidservant of God! Thy letter was received and its contents revealed the fact that the friends, in perfect energy and vitality, are engaged in the propagation of the heavenly teachings. This news hath caused intense joy and gladness. For every era hath a spirit; the spirit of this illumined era lieth in the teachings of Bahá’u’lláh. 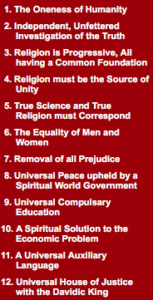 For these lay the foundation of the oneness of the world of humanity and promulgate universal brotherhood. They are founded upon the unity of science and religion and upon investigation of truth. 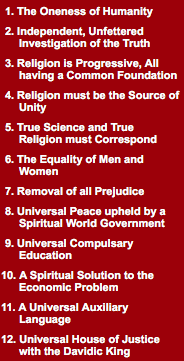 They uphold the principle that religion must be the cause of amity, union and harmony among men. They establish the equality of both sexes and propound economic principles which are for the happiness of individuals. They diffuse universal education, that every soul may as much as possible have a share of knowledge. They abrogate and nullify religious, racial, political, patriotic and economic prejudices and the like. Those teachings that are scattered throughout the Epistles and Tablets are the cause of the illumination and the life of the world of humanity. Whoever promulgateth them will verily be assisted by the Kingdom of God. The Báb was a young merchant of the Pure Lineage. He was born in the year one thousand two hundred and thirty-five [A.H.] on the first day of Muharram, and when after a few years His father Siyyid Muḥammad-Riḍá died, He was brought up in Shíráz in the arms of His maternal uncle Mírzá Siyyid ‘Alí the merchant. On attaining maturity He engaged in trade in Búshihr, first in partnership with His maternal uncle and afterwards independently. On account of what was observed in Him He was noted for godliness, devoutness, virtue, and piety, and was regarded in the sight of men as so characterized. THERE are certain pillars which have been established as the unshakable supports of the Faith of God. The mightiest of these is learning and the use of the mind, the expansion of consciousness, and insight into the realities of the universe and the hidden mysteries of Almighty God. O TRUE companions! All humankind are as children in a school, and the Dawning-Points of Light, the Sources of divine revelation, are the teachers, wondrous and without peer. In the school of realities they educate these sons and daughters, according to teachings from God, and foster them in the bosom of grace, so that they may develop along every line, show forth the excellent gifts and blessings of the Lord, and combine human perfections; that they may advance in all aspects of human endeavor, whether outward or inward, hidden or visible, material or spiritual, until they make of this mortal world a widespread mirror, to reflect that other world which dieth not. O ye friends of God! Because, in this most momentous of ages, the Sun of Truth hath risen at the highest point of the spring equinox, and cast its rays on every clime, it shall kindle such tremulous excitement, it shall release such vibrations in the world of being, it shall stimulate such growth and development, it shall stream out with such a glory of light, and clouds of grace shall pour down such plentiful waters, and fields and plains shall teem with such a galaxy of sweet-smelling plants and blooms, that this lowly earth will become the Abhá Kingdom, and this nether world the world above. Then will this fleck of dust be as the vast circle of the skies, this human place the palace-court of God, this spot of clay the dayspring of the endless favors of the Lord of Lords. O THOU revered maidservant of God! Thy letter from Los Angeles was received. Thank divine Providence that thou hast been assisted in service and hast been the cause of the promulgation of the oneness of the world of humanity, so that the darkness of differences among men may be dissipated, and the pavilion of the unity of nations may cast its shadow over all regions. Without such unity, rest and comfort, peace and universal reconciliation are unachievable. This illumined century needeth and calleth for its fulfillment. In every century a particular and central theme is, in accordance with the requirements of that century, confirmed by God. In this illumined age that which is confirmed is the oneness of the world of humanity. Every soul who serveth this oneness will undoubtedly be assisted and confirmed. O RESPECTED personage! I have read your work, The Gospel of Wealth,(1) and noted therein truly apposite and sound recommendations for easing the lot of humankind. Man reacheth perfection through good deeds, voluntarily performed, not through good deeds the doing of which was forced upon him. And sharing is a personally chosen righteous act: that is, the rich should extend assistance to the poor, they should expend their substance for the poor, but of their own free will, and not because the poor have gained this end by force. For the harvest of force is turmoil and the ruin of the social order. On the other hand voluntary sharing, the freely chosen expending of one’s substance, leadeth to society’s comfort and peace. It lighteth up the world; it bestoweth honor upon humankind. (1) An article from Andrew Carnegie’s book The Gospel of Wealth was published in England in the Pall Mall Budget and called The Gospel of Wealth, cf. Andrew Carnegie’s Autobiography, 255n. PRAISE be to Him Who hath rent the dark asunder, hath blotted out the night, hath drawn aside the coverings and torn away the veils; Whose light thereupon shone out, Whose signs and tokens were spread abroad, and His mysteries laid bare. Then did His clouds part and loaded down the earth with His bounties and bestowals, and made all things sweet with rain, and caused the fresh greenery of knowledge and the hyacinths of certitude to spring forth and to shake and tremble for joy, till the whole world was scented with the fragrance of His holiness. Salutations and praise, blessings and glory be upon those divine realities, those sacred windflowers that have come forth out of this supreme bestowal, this flooding grace that hath roared like a clashing sea of gifts and bounties, tossing its waves to the high heavens. Verily, art Thou the Giving, the Forgiving, the Ever-Bestowing. Verily, art Thou the Merciful, the Compassionate. O ye loved ones of God! The wine-cup of Heaven overfloweth, the banquet of God’s Covenant is bright with festive lights, the dawn of all bestowals is breaking, the gentle winds of grace are blowing, and out of the invisible world come good tidings of bounties and gifts. In flower-spangled meadows hath the divine springtime pitched its tents, and the spiritual are inhaling sweet scents from the Sheba of the spirit, carried their way by the east wind. Now doth the mystic nightingale carol its odes, and buds of inner meaning are bursting into blossoms delicate and fair. The field larks are become the festival’s musicians, and lifting wondrous voices they cry and sing to the melodies of the Company on high, “Blessed are ye! Glad Tidings! Glad Tidings!” And they urge on the revelers of the Abhá Paradise to drink their fill, and they eloquently hold forth upon the celestial tree, and utter their sacred cries. All this, that withered souls who tread the desert of the heedless, and faded ones lost in the sands of unconcern, may come to throbbing life again, and present themselves at the feasts and revels of the Lord God. Praise be to Him! The renown of His Cause hath reached to east and west, and word of the power of the Abhá Beauty hath quickened north and south. That cry from the American continent is a choir of holiness, that shout from far and near that riseth even to the Company on high is “Yá Bahá’u’l-Abhá!” Now is the east lit up with a glory, and the west rose-sweet, and all the earth is fragrant with ambergris, and the winds that blow over the Holy Shrine are laden with musk. Erelong shall ye see that even the darkest lands are bright, and the continents of Europe and Africa have turned into gardens of flowers, and forests of blossoming trees. But since the dawning of this Daystar was in Persia, and since from that orient the sun shone upon the west, it is our fondest hope that the flames of love’s fire should blaze ever more vehemently in that land, and that there the splendor of this Holy Faith should grow ever more intense. May the tumult of God’s Cause so shake that land to its foundations, may the spiritual force of His Word so manifest itself, as to make Írán the core and focus of well-being and peace. May rectitude and conciliation, and love and trust, issuing forth from Írán, bring immortality to all on earth. May she raise on the highest summits the banner of public order, of purest spirituality, of universal peace. How much less wound a man. Much less a brother harm. Let all your striving be for this, to become the source of life and immortality, and peace and comfort and joy, to every human soul, whether one known to you or a stranger, one opposed to you or on your side. Look ye not upon the purity or impurity of his nature: look ye upon the all-embracing mercy of the Lord, the light of Whose grace hath embosomed the whole earth and all who dwell thereon, and in the plenitude of Whose bounty are immersed both the wise and the ignorant. Stranger and friend alike are seated at the table of His favor. Even as the believer, the denier who turneth away from God doth at the same time cup his hands and drink from the sea of His bestowals. It behooveth the loved ones of the Lord to be the signs and tokens of His universal mercy and the embodiments of His own excelling grace. Like the sun, let them cast their rays upon garden and rubbish heap alike, and even as clouds in spring, let them shed down their rain upon flower and thorn. Let them seek but love and faithfulness, let them not follow the ways of unkindness, let their talk be confined to the secrets of friendship and of peace. Such are the attributes of the righteous, such is the distinguishing mark of those who serve His Threshold. The Abhá Beauty endured the most afflictive of calamities. He bore countless agonies and ills. He enjoyed not a moment’s peace, drew not an easeful breath. He wandered, homeless, over desert sands and mountain slopes; He was shut in a fortress, and a prison cell. But to Him, His pauper’s mat of straw was an eternal throne of glory, and His heavy chains a sovereign’s carcanet. By day, by night, He lived under a whirring sword, and He was ready from moment to moment for death on the cross. He bore all this that He might purify the world, and deck it out with the tender mercies of the Lord God; that He might set it at rest; that conflict and aggression might be put to flight, the lance and the keen blade be exchanged for loving fellowship, malevolence and war turn into safety and gentleness and love, that battlefields of hate and wrath should become gardens of delight, and places where once the blood-drenched armies clashed, be fragrant pleasure grounds; that warfare should be seen as shame, and the resort to arms, even as a loathsome sickness, be shunned by every people; that universal peace raise its pavilions on the loftiest mounts, and war be made to perish forever from the earth. O ye loved ones of God! Praise be to Him, the bright banner of the Covenant is flying higher every day, while the flag of perfidy hath been reversed, and hangeth at half-mast. The benighted attackers have been shaken to their core; they are now as ruined sepulchers, and even as blind creatures that dwell beneath the earth they creep and crawl about a corner of the tomb, and out of that hole, from time to time, like unto savage beasts, do they jibber and howl. Glory be to God! How can the darkness hope to overcome the light, how can a magician’s cords hold fast “a serpent plain for all to see”? “Then lo! It swallowed up their lying wonders.”4 Alas for them! They have deluded themselves with a fable, and to indulge their appetites they have done away with their own selves. They gave up everlasting glory in exchange for human pride, and they sacrificed greatness in both worlds to the demands of the insistent self. This is that of which We have forewarned you. Erelong shall ye behold the foolish in manifest loss. O my Lord and my Hope! Help Thou Thy loved ones to be steadfast in Thy mighty Covenant, to remain faithful to Thy manifest Cause, and to carry out the commandments Thou didst set down for them in Thy Book of Splendors; that they may become banners of guidance and lamps of the Company above, wellsprings of Thine infinite wisdom, and stars that lead aright, as they shine down from the supernal sky. Verily art Thou the Invincible, the Almighty, the All-Powerful. You are currently browsing the Baha'i Justice blog archives for October, 2016.